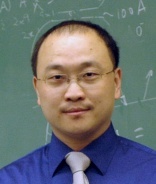 Dr. Tianfeng Lu joined the department as an Assistant Professor in 2008. Dr. Lu received his B.S. (1994) and M.S. (1997) in Engineering Mechanics from Tsinghua University and Ph.D. (2004) in Mechanical and Aerospace Engineering from Princeton University, where he has been a research associate from 2004 and a research staff from 2005. His primary research interests include computational fluid dynamics with detailed chemistry as well as reduction of large chemical kinetic mechanisms for computationally efficient simulation of complex multidimensional, turbulent flows and other engineering systems. He was appointed as United Technologies Associate Professor of Engineering Innovation in 2016.